Halloween Bento #7 - Shimmy Shimmy Cake! PB and Nutella sandwich. Eyes are pre-made from Wilton and left over from our office Halloween party. The rest of the details are piped on with Nutella. I colored the nutella black using black cocoa powder. It also gives it some stiffness. Apple alien with almond sliver teeth and a plastic ring for the eye. Mozzarella eye balls with cheese and more Wilton sugar eyes. Caramel dipping sauce in the container. 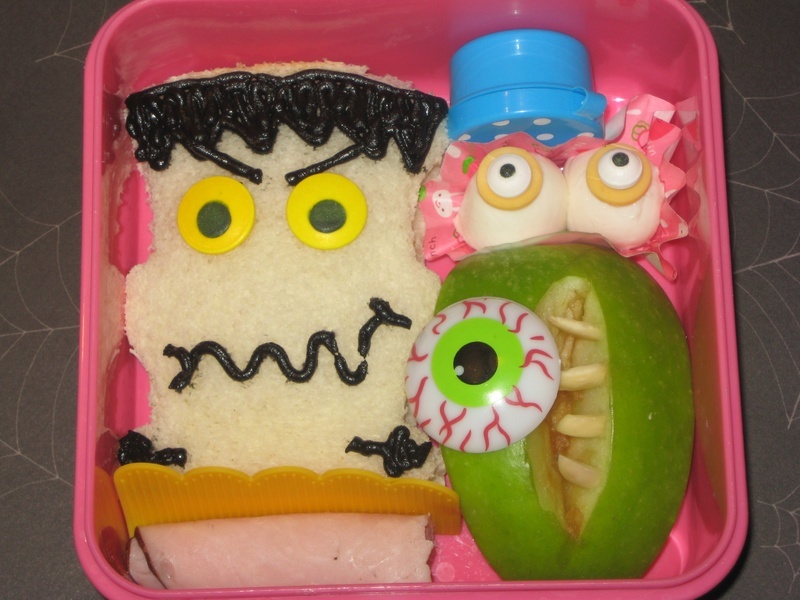 So sad that tomorrow will be the last Halloween bento I make! I'll try and go out with a bang!